Would you like a call when auroras appear over your hometown? Sign up for Spaceweather PHONE. SPECTACULAR AURORAS: What do Alaska and Arizona have in common? Northern Lights. Auroras appeared over both states on Dec. 14th when a coronal mass ejection (CME) hit Earth and sparked a severe geomagnetic storm: gallery. That storm has subsided, but another may be in the offing. NOAA forecasters estimate a 50% chance of severe geomagnetic activity on Dec. 16th when a second CME is expected to hit. 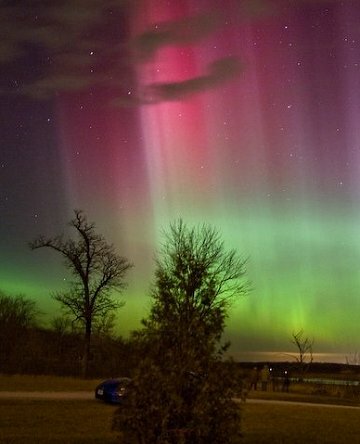 Sky watchers should remain alert for auroras. Above: Auroras over Saylorville Lake, Iowa, on Dec. 14th. "It was a beautiful display--lots of movement and pulsations, nice flowing curtains and some beautiful red beams," says photographer Stan Richard. "The show lasted for one and a half hours." Above: Sean Walker of Chester, New Hampshire, used a Coronado PST to take this picture on Dec. 16th. It was nice to get "one last look at 930," says Walker. 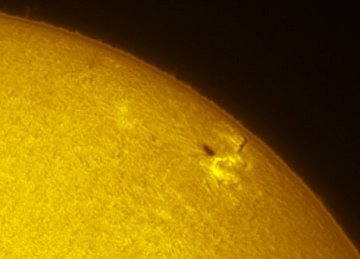 "There's also a beautiful forest of prominences on the other side of the sun: image."